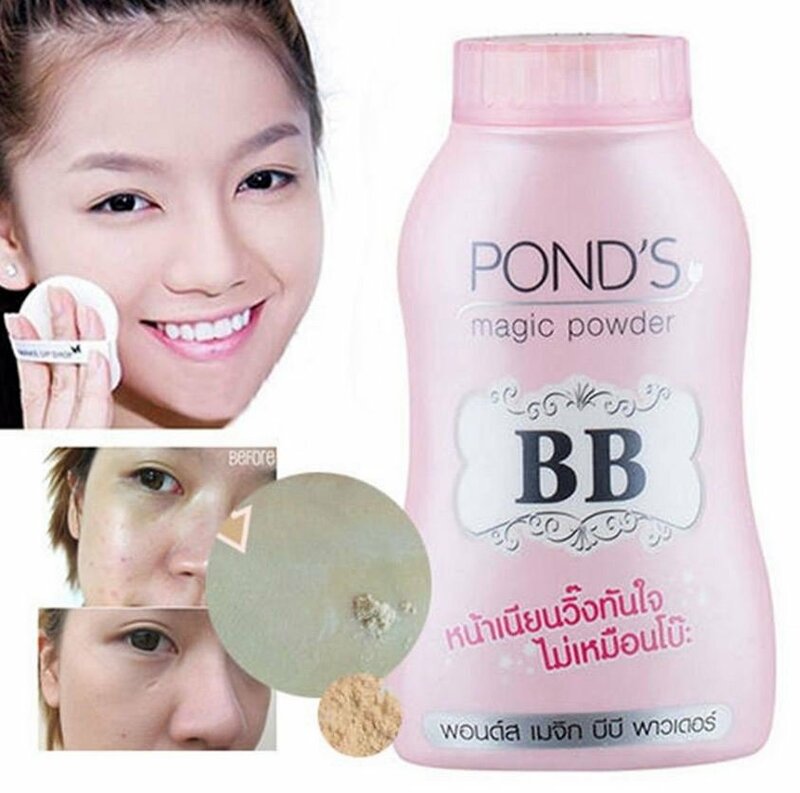 Made in Thailand Pond’s BB Magic Powder is one of the country’s most popular beauty products. It is a fine, light smooth pink radiant powder that is good as a matte face foundation powder base. BB Magic has been praised as a great finishing powder that will keep even the oiliest of faces matte for hours and hours. BB gives a very a light coverage compared to foundation creams or pressed powder foundations. There is a very light coverage compared to using regular foundation cream or a pressed powder foundation. BB prevents an oily shine that helps to eliminate your skin imperfections. By absorbing extra sebum on the skin. This is successful due to the high content of the antimicrobial and the anti-inflammatory natural ingredients. Use BB as a sunscreen product to reduce the risk of sun exposure. It gives Double UV and UVB rays protection to your face and neck. Fine BB Magic loose powder can help the covering of blemish scars, melasma and freckles. BB is clinically proven to be gentle, safe, mild and helps to eliminate friction. Allergy and dermatologically tested with effective Oil & Blemish Control. It is highly portable and its small size will fit in your purse. BB powder is produced by Pond’s. This is a very popular cosmetic brand owned by the British-Dutch multinational company Unilever. Formulated with talc and vitamin B3 to be a multipurpose foundation cream that is designed to perform several tasks at the same time for the whole day. It has a matte calming effect on the skin. As a result sebum is regulated in its secretions. Which helps to eliminate melasma, acne, blue spots, wrinkles, blemishes, freckles, scars and relieves inflammation. Because the BB powder is very finely ground it is easy to apply with a brush or just using your fingers. BB is suitable for all skin tones. Pond’s BB Magic Powder will last all the day without reapplying. Apply it over your foundation or just apply alone. However it would be advisable to apply your moisturiser cream of choice first. Just release the cap and apply a little BB powder to the palm of your hand. Then using a foundation brush or your fingertips, just apply the powder on your face and neck. Spread carefully and remove any excess powder with a dry brush. Talc, Cyclopentasiloxane, Niacinamide , Titanium Dioxide, Zinc Oxide, Aluminum Stearate , CI 77492, Fragrance, CI 77499, CI 77491, Mica, Aluminum Hydroxide. BB Magic Powder is worth checking out. You will find the price is right for you and it is a nice way to explore some sunscreen touchups and some scalp UV protection. If any irritation occurs, then please discontinue use and consult a doctor.